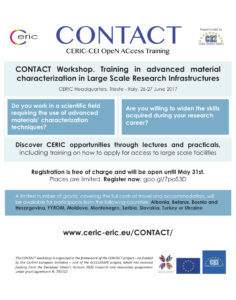 CERIC-ERIC and the Central European Initiative – CEI are glad to invite you to the CONTACT workshop, taking place at the CERIC headquarters in Trieste,on 26-27 June, 2017. 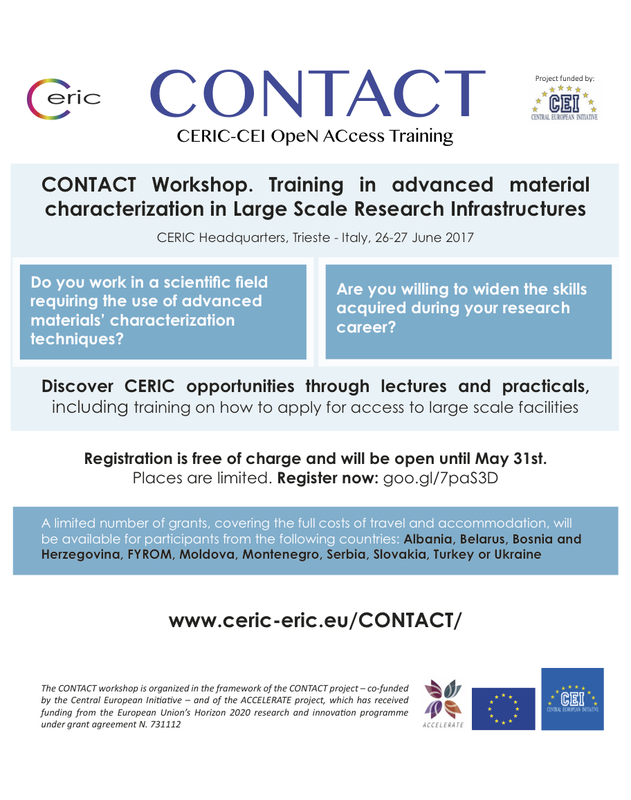 The CONTACT workshop is open to researchers at any career stage, working in fields requiring advanced materials characterization and having none or limited experience in the use of large-scale research infrastructures. Through interactive sessions held by internationally known scientists, including both theoretical lectures and practical tutorials on synchrotron beamlines, you will get acquainted with the scientific opportunities offered by CERIC. In addition, you will acquire all necessary knowledge to access state-of-the-art techniques for the analysis and synthesis of materials and biomaterials in large-scale facilities. Registration is free of charge and will be open until May 31st. Since limited places are available, we encourage you to register at your earliest convenience through the online registration form. A limited number of grants, covering the full costs of travel and accommodation, will be available for participants from the following countries: Albania, Belarus, Bosnia and Herzegovina, FYROMacedonia, Moldova, Montenegro, Serbia, Slovakia, Turkey and Ukraine. CERIC Headquarters, S.S. 14, km 163,5 in AREA Science Park, 34149 – Basovizza (Trieste) – Italy.